Considered the progenitor of the Thorne Family of America, William was an Anabaptist. He came to America on 10 April 1635, possibly arriving on the ship "Confidence" at age 18 with Peter Thorne, believed to be his brother. He was one of seventeen English families to establish Flushing, Long Island in 1648. The third signer of the Flushing Remonstrance, he was a religious activist. Descendants of William Thorne This will link to a web site that lists all the descendants of William Thorne that I currently have in the database. This site is continually updated so check it often for recent additions. The Flushing Remonstrance of 1657 This the contents of the Flushing Remonstrance wherein the residents in 1657 petitioned the Dutch Governor, Peter Stuyvesant to lift his ban on religious meetings by Quakers, also included are copies of historical archives which delineate Stuyvesant's ensuing actions. Among other ancestors, William Thorne and his son were the third and fourth signers of this "Remonstrance of the Inhabitants of Flushing, L.I., Against the Law Against Quakers." The real result of this document? It was used over one hundred years later as the basis for the cornerstone of our current Bill of Rights, the guarantee of religious freedom without fear of persecution. We can thank the courage and convictions of people like William Thorne and his son for much of what we take for granted today! A Remonstrance Profile A father and son signers of the Remonstrance was the Thorne family; William Sr. and William Jr. Like so many of his friends and neighbors William Thorne Sr. followed the pathway to Flushing in order to escape the religious intolerance of his earlier New England associations. This document, written by Thorne Dickenson (a descendant of William Thorne), gives a brief historical perspective of the early Thorne family in America. Flushing Freedom Mile A brief expose from "Newsday" of the famous Flushing street where John Bowne lived. John Bowne was the catalyst for the Remonstrance, since he was arrested by Stuyvesant for allowing Quakers to meet in his home. For this, Stuyvesant sent Bowne back to Holland to stand trial for seditious acts of treason. He was returned to New Netherland acquitted of all charges. John Bowne is John Coutant Thorn's 9th Great Grandfather. Early Quakers in the US A brief historical reference on early Quakers, especially how they were persecuted in the New World. William was a Puritan, with Anabaptist leanings. He arrived in the Massachusetts Bay Colony between 1635 and 1638. He was one seventeen English families to establish Flushing Long Island in 1645 and Gravesend in 1643. 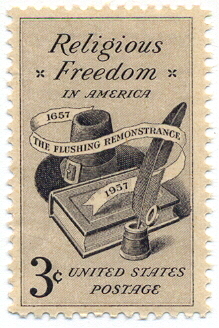 He was the third signer of Remonstrance of Flushing (a precursor to the Bill of Rights). A religious activist. He is considered the Progenitor of the Thorne Family of America, possibly arriving on the ship Confidence in 1635 at age 18 years, with Peter Thorne, believed by some to have been a close relative, although there is nothing to substantiate this position. It is generally believed he came from Dorsetshire, however, there is no evidence to support that. There was another William Thorne, who for a short time, became embroiled in a legal matter in New York. In a statement to the court, this William Thorne declared that he was from Dorset in old England. This William has been proven to be another Thorne. The information regarding our William Thorne and Dorset must stem from this instance. While there are those who feel he may have arrived aboard the English ship The Confidence. In fact, there is no William Thorne of record on any ship arriving in Boston during the years of 1635-1638. Many of these early English arrivals traveled under false names as they were fleeing the evils of Charles I and his Star Court. While other ships were limited to a set number of passengers per family. In cases of the latter they would travel with friends or family under their family names. On 2 May 1638, he was made a FREEMAN of the Massachusetts Bay Colony, which indicated that he was a landowner and a man of at least modest means. It also gave him the right to vote, which was limited solely to landowners. At this time there were about 10,000 people in the colony and only 400+ had the right to vote. One of these was our William. He was a man of tremendous political and religious convictions, which led him to be at odds, with the status quo from the outset. That trait seems to have come down to us from him through these many generations. He and many of his offspring were to later become Quakers and, as such, the family has played an active role in founding of what was eventually to become a very powerful and diverse nation. According to the Pearsall Family Genealogy The THORNE family dates from about 1470. When Thomas Thornes of SHROPSHIRE-STAFFORDSHIRE was Proprietor of the manor and estate of THORNES in the parish of Shenstone. It was said that members of the family had previously been resident in Shrewsbury, Shropshire, for some 90 years. THOMAS THORNES married Mary Corbet daughter of Sir Roger Corbet. Son Roger was grandfather of: Roger THORNES (called The Wyse Thornes) who married the daughter of Sir Roger Kynaston lived Shrewsbury, Shropshire d. 1531 buried St. Mary's Church. It has been stated that the name possibly derived from any group of people, who may have lived in an area, that was associated with thorn trees or bushes. I believe that part of this is probably accurate. My hunch is that at some point in time in the very remote past, probably not long after the Norman Conquest, when surnames began appearing, something of that nature transpired. I don't feel that people throughout the British Isles, who happened to be living around a thorn bush, suddenly became Hugh of Thorn/e. I think it far more likely, that a single group of people, closely related by blood, began the use of the surname as a means of distinguishing themselves from their neighbors. The name then slowly spread throughout all of the British Isles. For the most part, surnames never have been a casual thing. The basic unit of society in feudal England was the extended family, commonly known as the clan. With the surname Thorne, I am sure that early on in English history, our remote ancestors, took up this name with much the same pride and sense of family/clan identification that we have today. I have spoke with Thorn/e's all over the United States, who steadfastly will deny any relationship with another Thorne family right down the road. When in several instances I have been able to prove their blood kinship! Whether the name be spelled Thorne or Thorn makes NO difference whatsoever. In my own direct line back to William Thorne, it was my line of the family that seems to have dropped off the final E. Yet our immediate clan has always retained it. I am convinced that whether your own specific Thorne ancestor is our William of Flushing or yet another, more recent arrival, we are ONE FAMILY. My training as an anthropologist, has taught me that while isolated occurrences can happen, they are highly unlikely and investigation will frequently identify the common link. I have carried the task of tracking down our early Thorne roots, to the very best of my ability and resources. It will remain to future generations to carry the task home. I am told by family members, who have traveled in England on historical hunts, that there are literally mountains, of as yet not cataloged papers and manuscripts. In this information based society and with the aid of computers, someday the full story will come out. William Thorne is the 9th Great Grandfather of Philip Voyle Thorne. William Thorne is the 10th Great Grandfather of John Coutant Thorn. The genealogical material contained in this record regarding William Thorne of England, Lynn, Massachusetts and Long Island, NY, covering the first 6 generations down to John 6 Thorne and Mary Birdsall of Newburgh, NY is derived from the archives of the New York Genealogical and Biographical Record. The individual responsible for much of the work must be recognized. He was Thorn Dickinson. He was a Thorne descendant, who never married, was an engineer by profession and a grand lover of his Thorne birthright. The man who oversaw this publication on the family of William Thorne is named Harry Macy, an imminent Long Island genealogist. I spoke personally with him in June of 1992. He said it was the most singularly extensive family project they have undertaken to date. It was of particular difficulty as William's descendants seem to have largely ignored their family history. Thus, the information was retrieved from many family histories with whom the Thornes have married, as well as all the other usual sources. Macy feels that the information is accurate and reliable. William Thorne was born "not later than" 1617, undoubtedly in England. William married Susannah Booth before 1636, either in Massachusetts or England. Between 1635 & 1638, he arrived in Boston. 2 May 1638: William Thorne was made a Freeman of Massachusetts Bay Colony at Lynn, Mass. This indicates that at this point, he was a Puritan in good standing with the Church of Boston; it further offers proof that he was of legal age, a man of some means and was held in good social standing. 29 June 1641: William served on a jury in Salem, county seat of Essex County, MA., 5 miles from Lynn. 7 September 1641: William Thorne was fined 6 2/3 pounds for concealing, hiding & supplying the escaped son and son-in-law of Ann Marbury Hutchinson (Francis Hutchinson & William Collins, all were opponents of the Church of Boston). Ann was from Alford, Lincolnshire, England. 28 Feb 1643: William Thorne was found guilty in the court held at Salem, Essex County for refusing to serve in the Military Watch. He had already LEFT Boston at this point. He is said to have gone overland with Michael Milner to Sandwich in Plymouth Colony; he and Milner eventually arrive in New Amsterdam, in time to become part of the Patent at Gravesend (June 1643). June 1643: Lady Deborah Moody left Boston for Rhode Island and eventually New Amsterdam. June 1643: Lady Moody received a Patent for the Village of Gravesend on Long Island. William Thorne was one of the original Patentees. September 1643: Anne Hutchinson and most of her family were murdered by the Mohican Indians at Rye, New Amsterdam. September 1643: The Mohicans next attacked Gravesend. Moody's followers along with William Thorne beat off several successive Mohican attacks, killing many of them in the process. Only the Moody group's homes survived this uprising. August 1645: Governor finally ended war with Indians. 10 October 1645: William Thorne is granted a Patent for a village at Flushing Creek, along with sixteen other Englishmen. 19 Dec 1645: Dutch Governor Kieft grants final Patent for Gravesend to Moody, Thorne, et al. He had confiscated the original. 21 March 1656: William Thorne granted Planters Lott at Jamaica, Long Island, he was not one of the original seventeen but of the second group. 27 December 1657: Remonstrance of Flushing is drafted and William Thorne is the third to sign. Between 27 December 1657 and 12 May 1664 is the time frame during which William is believed to have died. He clearly held Anne Hutchinson's belief's, or were there additional ties, that led him to support her? She had been influenced by her father reverend Francis Marbury. Francis Marbury was an outspoken and radical Puritan minister. Reverend Marbury and his family were from Alford, Lincolnshire, England. Alford was but a short distance from a little village named Gunby in Candleshoe, Lincolnshire, England (will come back to this later). Marbury was very active in Alford for many years and later went to London, where he continued his views. While still part of the Boston Colony, Lady Deborah lived in the same village as William Thorne: Lynn. They attended the same church in Lynn, undoubtedly knew one another from that period. and they held the same religious and political views. According to Gov. William Bradford, the closest friend she had in the colony was Thomas Savage. He was married to a daughter of Ann Hutchinson. I feel there are links of blood, religious views and former acquaintances in England that bound these families together. A coincidence? Thomas Fones, father of Elizabeth Fones, was an apothecary in London. It was to Thomas Fones that Sir Henry Moody (Deborah's husband) went for his medications, when he was terminally ill, in London. Thomas Fones died before Moodie and in his will he made their Uncle, Governor John Winthrop, their custodian. Daughter Elizabeth Fones first married Henry, Governor Winthrop's son. (Gov John Winthrop was from Edwardstone, SUFFOLK, England.) After his death she married Robert Feake; they had a daughter Hannah. Hannah Feake married John Bowne. Their daughter Mary Bowne, married William Thorne's son Joseph. Their youngest daughter Martha Johanna Bowne married William's grandson Joseph Thorne>John>William. In Gunby, Candleshoe, Lincolnshire, England there was a family named THORNE. This family was resident here for at least four generations (which is as far as the records permit). They were there at the same time as the Marbury's were in Alford. John Thorne (Gentleman), born 1562-1582 buried 12 June 1621. Cavendish, baptized 25 July 1610 buried 10 June 1611. John, baptized 3 July 1614 no further record. William, baptized 31 July 1617 no further record. Susannah, baptized 4 October 1608 no further record. As both parents were deceased by 1621, they would have been placed with friends or relatives, presumably in the area. Gentleman John Thorne's father was FRANCIS THORNE; he was buried in Gunby on 7 October 1601. Gentleman John Thorne's mother was JANE CAVENDISH; she was buried in Gunby on 3 September 1608. Francis Thorne had brothers named Richard & Nicholas; their parent's names are unknown and each of the 2 brothers had offspring!! I have a feeling that this is our William Thorne, be forewarned that there is no clear evidence linking them to us, but the odds look fairly good. The John Thorne listed above may well be the John Thorne, who left his small estate to Ann Pallgrave. Ann had come to Boston with her stepfather John Youngs. Youngs led a party to New Southold on Long Island and ONE of his colonists was Ensign JOHN BOOTH. Southold is in adjacent Suffolk county to Lincolnshire. Further Long Island Genealogies speculate that the Francis Thorne, who was in Rye for a short time and went back to Greenwich, Connecticut may well have been another son that went unrecorded of our William Thorne, the Immigrant. This Francis Thorne died in Greenwich, Connecticut 22 Dec 1690, after having lived in both Massachusetts and Rye, Westchester County, New York. He, too, had a flair for religious controversy, but he was in favor of infant baptism. Last modified on August 12, 2006.